The two pictures above give you a look at the first 6 samplers in our Abecedarian project. One will be released each month. 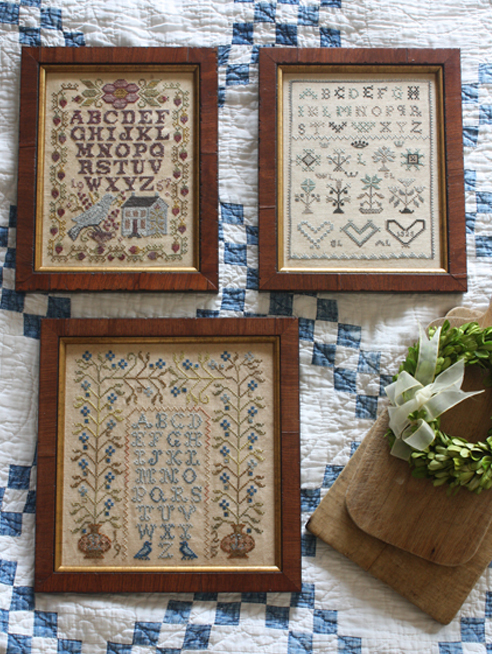 Each sampler is framed exactly alike. When all 12 of the pieces are completed and framed they fit together and make a collage of images and stitches. We were imagining them over a fireplace or on a dining room wall or over a headboard in the bedroom. Each sampler records our families' genealogy too. (I must confess when you look at the samplers hanging on my walls, you would think I inherited all of my grandmother's needlework. It looks like I come from a family of tireless stitchers. My initials are missing from most of the samplers I have stitched.) Samplers seem to be the perfect medium to record my families genealogy. This Loose Feather collection highlights the reason we love samplers. Each will have an alphabet, some of our favorite motifs, and be dedicated a member of our family. The first pattern of the series goes to the printer tomorrow and will be a July release. It's shown below. Barb designed this one in memory of her grandmother Mildred Larson, an avid bird watcher. She wanted to do a piece that reflected her grandmother's interest. A chart for numbers is provided so you can change the date and initials to celebrate the birdwatcher in your family. These all look wonderful! Love your designs! So excited!!! Thank you for more gorgeous patterns. Have you ever thought about re-releasing some of the older ones for newer stitchers? These are beautiful! I am signed up through my LNS, looking forward to receiving these! I love them all !! Can't wait!!! li voglio tutti dove li posso trovare?sono bellissimi complimenti ROSELLA. Fabulous! I am already on the list at my favorite needlework shop (The Old Mill in Liberty) and can hardly wait. What a fun year of stitching ahead! I will be purchasing every last one of them. Wonderful! Thanks for giving us so much to look forward to! Since I am not planning a splendid vacation this year, I will stitch splendid designs instead. Oh my goodnes - I am beside myself with happiness over these samplers- LOVE THEM! Are the all done on the same count and kind of linen? I was thinking of stitching them and then combining then into a wall quilt with one of your wonderful fabrics. Can't wait to get my hands on these! I'm so glad this is number 1. It's my favorite so far! Can't wait to order. Wow - they are all beautiful. Glad the bird is #1 as I love watching them myself! Cant wait for these to come out! Beautiful! These are going to be a joy to stitch! You've been away far too long, but seeing those stitcheries, I may forgive you!! I MUST stitch the first one for myself!! Can't wait to see the whole group together as one - what a magnificent display that would be!! So glad I signed up for this one as I love alphabets. Ooo, my very favorite is the bottom one in the top photo..any idea when that one will be published? So pretty! The linen is 30ct. We usually do it on a larger count as it is easier for most of us to work on. The finished size is a 6" square. Not all of the projects will be the same size...but all of ours are stitched on 30ct. These Samplers are just gorgeous. Please clarify something though. I thought that Agnes Platt was the first Loose Feathers for 2013. 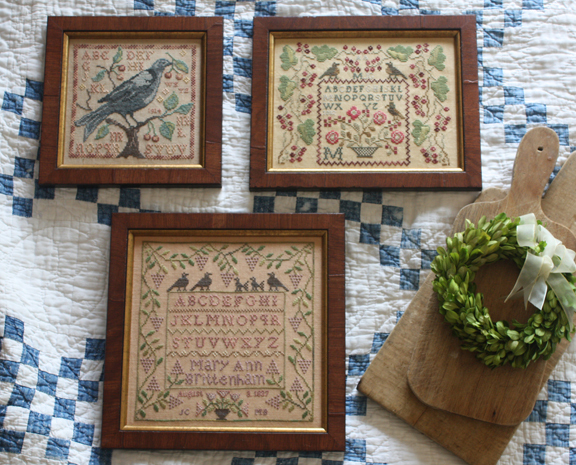 Agnes Platt finished our Reproduction series of Loose Feather projects. We aren't very good about sticking to the Jan. to Jan. time frame. This series will run through June 2014. Love them all. Another BBD winner! I am a big Loose Feathers fan and love this series since I am an avid birdwatcher also. One request - please post if the pattern is over two or a combination of stitches. I still use Aida and combinations make a big difference to whether I can work it or not. Most of the stitches are over two threads...which translates to Aida easily. The first one has some letters over one thread, which could be a problem for you using aida. Maybe you could adapt those areas to fit on the aida. Take a look at the pattern when it arrives in your local shop and see what you think. I saw a lovely quilt posted on Pinterest that refers to your book Hogden Camp. Any chance of a re-release so that we can all have a chance at it? Love the samplers, too! Higdon Camp has several patterns that are in demand now. We plan to redo them in the near future so they can be sold as a pdf. I will notify when the pattern is available on the blog site. Love them all but especially the one with cherries. Question- I am looking for cross stitch pattern of barbs called America. You based the quilt camp reveille on it. Is it a single pattern and where can I find it? We still have some available. Your local cross stitch shop can order one for you from their distributor. They should be able to get one for you in a week or so. I always love your designs and plan to do all of these to hang over my bed. Will they all be on the same color of linen? If so, do you have some idea of how much of the linen I would need to do them all, as I would like to get it all at the same time so they would be from the same dye lot? The samplers will be on different colored linens. We made sure the linens look good together....but thought a bit of difference would be more visually interesting. They absolutely beautiful.Love all them! 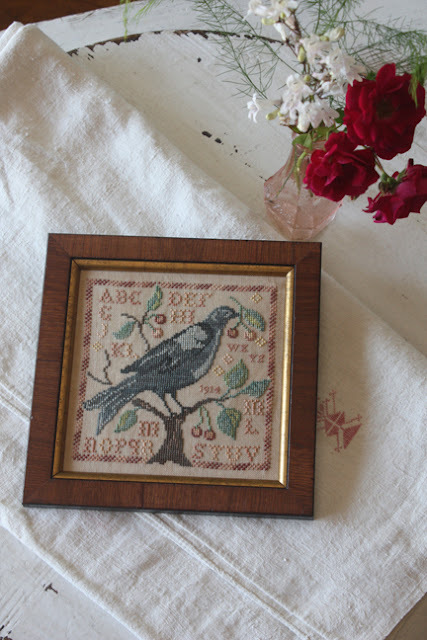 I would love to see a wild rose bush with rose hips and of course, some birds in one sampler. I am working on #1 and am busting at the seams to tell you ladies what I have planned for this series! I am really excited about it! great piece of work. Keep inspiring us with your work. My, those are definitely lovely and a must have! I love the designs of it all. They are just simple yet speak of a thousand words from the heart. I just wish I could create or make something like these too. But I’ve got no more time available to do it. Maybe after a couple of years I would. What beautiful work. I'm relatively new to cross stitch and I absolutely LOVE it!! I run a craft group and write a craft column for my local paper ... I'm trying to Inspire newcomers into crafting cosy characterful homes with easy projects, patterns and ideas. Do you have any suggestions / or patterns for those new to cross stitch?? . A professional web design company can make the website with the best qualities.Choosing the right company is always vital thing. these looks very great to see and thanks for sharing with us.